Matt Boyd is the cofounder and editor of Die Cast X Magazine. Boyd helped found Die Cast X Magazine in 2005 and served as its editor until 2009. In 2014, he returned to DCX as Executive Editor. 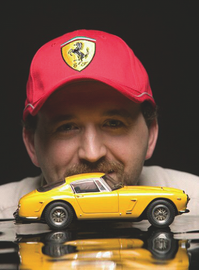 Boyd has written extensively on collectible scale modeling, design and industry trends, and reviewed hundreds of models for every major brand in the diecast industry. In addition, he has published a number of articles on full-scale motorsports, automotive history and a handful of other non-automotive genres.